YUMI works much like Universal USB Installer, except it can be used to add more than one distribution to run Live from your Thumb Drive. USB Bootable Distributions can also be uninstalled using the same tool! 02/14/2019 YUMI-UEFI-0.0.1.3.exe: Update to support Kodachi and Memtest86. Implement 7zip version 18.6. Fix broken Redo Backup homepage link. Add Anonymous Browsers section. Add Home, FAQ and Support links. IMPORTANT NOTES: Your USB drive must be Fat16/Fat32/NTFS formatted, otherwise Syslinux will fail and your drive will NOT Boot. NTFS may not work with every distribution but is required for storing files over 4GB. YUMI UEFI must use Fat32 format. YUMI can be used to format your select USB drive, but be aware that all partitions on the selected drive will also be deleted. Ensure that you have made a backup of any information you want to keep before using YUMI on any drive. Please inform me of unlisted "FREE" Live Linux distributions or version revisions, and I will attempt to update YUMI to support them. Bootable Software developers who wish to have their "PAID" software added, can send me a copy to try. 01/06/19 Version 0.0.1.2: Fix to remove duplicate Linux Distributions Menu entry. 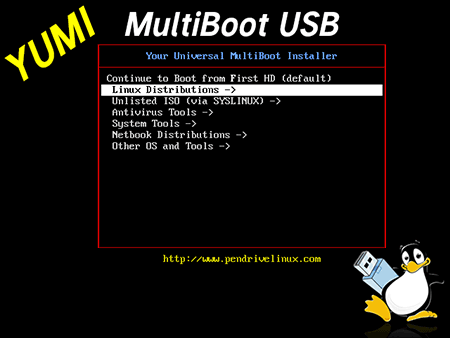 Edit Grub 2 config to set root by –label MULTIBOOT. Revert to set gfxmode=640×480 as auto still exhibits rendering issues on BIOS boot. 12/27/18 Version 0.0.1.0: Fix case in configfile path (change from EFI/boot to EFI/BOOT) in boot/grub/grub.cfg. Update to use GRUB 2.03. 11/04/18 Version 0.0.0.9: Update to support newer Ubuntu and derivatives using initrd instead of initrd.lz,.gz, etc. 04/26/18 Version 0.0.0.8: Fix various broken links. 03/10/18 Version 0.0.0.7: Update to support UEFI 32 bit firmware. Update to support newer Debian Live, and Fedora Workstation Live. 12/10/17 Version 0.0.0.6: Update to support AEOMI Backupper. Fix broken Tails. 10/06/17 Version 0.0.0.5: Update to support newer Tails and Manjaro. Fix broken Debian, Lubuntu, and Xubuntu links. Replace empty spaces in copied ISO files with dashes to prevent paths from breaking. 01/19/17 Version 0.0.0.4: Fix to replace empty spaces in Distro filename with dashes. Update Get Drives function to ignore system and network drives. Correct some wording. 08/19/16 Version 0.0.0.3: Add support for Arch Bang, Skywave Linux, and Cyborg Linux. 06/28/16 Version 0.0.0.1: Initial Release. 01/16/19 Version 2.0.6.3: Fix broken bootloader from version 2.0.6.2. 01/10/19 Version 2.0.6.2: Update Fedora boot method. Remove changing of generic.lst to $ISOFileName.lst as sometimes the filename becomes too long to detect. Consolidate generic.lst entries into basic.lst. Create syslinux.bin file to be used for chainloading. 12/02/18 Version 2.0.6.1a: Update to support newer Ubuntu and derivatives using initrd instead of initrd.lz,.gz, etc. 11/30/18 Version 2.0.6.1: Include ability to see which Disk the drive letter is on. Improve DiskWipe option – rescan before creating a new partition. 11/28/18 Version 2.0.6.0: Set Fat32 and NTFS Format options to format only the selected Volume Drive Letter. Include a new option to Wipe Entire Disk (including all attached Volumes/Partitions). The Wipe Entire Disk option can be used to Restore USB drives made bootable with DD, or to convert them back to use a single partition with a bootable MBR. 10/31/18 Version 2.0.5.9: Update to support Pearl Linux. Fix some broken links. Fix Solus entry. 07/20/18 Version 2.0.5.8: Update to support Norton Bootable Recovery Tool, Quick Save Live, Hiren's Boot CD PE, and newer CentOS 7 Live. 06/19/18 Version 2.0.5.7: Update to support Kodachi, and newer Kaspersky Rescue Disk. 05/06/18 Version 2.0.5.6: Update to support GeckoLinux and newer Porteus. 04/25/18 Version 2.0.5.5: Fix various broken links. 03/07/18 Version 2.0.5.4: Added initial support for KaOS, VyOS, Bluestar Linux, Raspberry Pi Desktop, and XenialPup. Medicat now extracts to the root folder until I find a fix for lost paths. 01/09/18 Version 2.0.5.3: Added support for Super Grub2 Disk, Trisquel, newer LXLE, and Medicat. 12/18/17 Version 2.0.5.2: Added support for MX Linux and Feren OS. 10/28/17 Version 2.0.5.1: Added support for Parrot, Vinux (for the blind and visually impaired), POP!_OS, and WifiWay 3.5. 09/26/17 Version 2.0.5.0: Added support for Antergos, PureOS, CentOS Installer, Ubuntu Mini (Netboot Installer), and recent Debian Live and Tails Images. Corrected broken Debian homepage link and Lubuntu, Xubuntu download links. 05/06/17 Version 2.0.4.9: Fixed recently broken Debian Live entry. Added option to set Windows to Go VHD file size. 05/01/17 Version 2.0.4.8: Update to support Neon, Finnix, Devuan, Vinari OS, and Ubuntu Budgie. Added compatibility test file. 04/19/17 Version 2.0.4.7: Update to support newer Manjaro and Archlinux. Address potential missing Config file errors when subsequently adding distributions. 03/27/17 Version 2.0.4.6: Quick fix to correct the double Distro list during step 2. 03/22/17 Version 2.0.4.5: Add ability to create larger than 4GB casper-rw persistent file if using NTFS format for Ubuntu and Linux Mint – (creates 4th partition table). Added casper-rw creation progress banner. 03/13/17 Version 2.0.4.4: Add filesystem type to drivelist. Include message box to notify of NTFS filesystem requirement for Windows to Go option. 03/03/17 Version 2.0.4.3: Add Windows to Go VHD option. Added more info for syslinux warning. Added Diskpart NTFS format option. 02/22/17 Version 2.0.4.2: Temporarily limit format option to removable media only. 02/16/17 Version 2.0.4.1: Quick fix to address broken format option. 02/12/17 Version 2.0.4.0: Temporarily add back Single Windows Vista/7/8/10 Installer option (which extracts all files from ISO to root). Add lock and dismount capability. 02/02/17 Version 2.0.3.9: Update to support OSFClone, newer WifiSlax, and NetRunner. Correct AntiX entry to use bdir=. Update to replace empty spaces in iso file with dashes. Correction to GRUB Partition 4 option. 01/30/17 Version 2.0.3.8: Quick Fix for singular and multiple Win PE builds. 01/28/17 Version 2.0.3.7: Update to support various Win PE builds. Modified distribution removal process. Corrected font size for Show All ISOs option. 01/14/17 Version 2.0.3.6: Update to support multiple Windows Vista/7/8/10 Installers. -wimboot option stores the extracted Multi Windows Installers in their own directory. -bootmgr option moves only bootmgr and bcd to root of drive. (note: -bootmgr option does require a Windows Vista or later host to run bcdedit). 12/27/16 Version 2.0.3.5: Fix to replace empty spaces in Distro filename with dashes. Add Windows PE (WIM) boot options (unfinished). Implement wimboot capabilities, Switch to newer Grub4Dos. Update labels. 12/22/16 Version 2.0.3.4: Quick fix to correct the double Distro list during step 2. 12/19/16 Version 2.0.3.3: Update Get Drives function to ignore system and network drives on subsequent YUMI installs. Corrected UI vesamenu paths. 12/12/16 Version 2.0.3.2: Update to support Solus. Reinclude show all drives option. Disable FSCTL lock, dismount, and unlock volume features until a better solution is found. 12/10/16 Version 2.0.3.1: Update Get Drives function to ignore system and network drives. Add filesystem and drive type to drive list. Add lock, dismount, and unlock features. 12/02/16 Version 2.0.3.0: Update to support ChaletOS and Bunsenlabs. Support newer Fedora Workstation Live and Zorin Core ISOs. Fix CentOS Link. Create a trk3 directory at the root of USB before copying files (necessary for Windows XP copyfiles). 10/03/16 Version 2.0.2.9: Switch back to 7-Zip 9.20. 09/14/16 Version 2.0.2.8: Fix menu entries for boot repair, and elementary OS. Upgrade to 7-Zip 16.02. 08/18/16 Version 2.0.2.7: Add support for Arch Bang, Skywave Linux, and Cyborg Linux. 07/07/16 Version 2.0.2.6: Add support for Android-x86. Fix broken Manjaro entry. Update credits and sources. 07/01/16 Version 2.0.2.5: Fix Eset, avira, and Dr.Web menu entries which became broken in build 2.0.2.4. 06/28/16 Version 2.0.2.4: Update to support Cub Linux. Fix broken WifiSlax entry. Use alternate method for old Ubuntu derivatives with conflicting syslinux gfxboot. 06/01/16 Version 2.0.2.3: Fixed bug: calculating remaining space on USB drive. Switch back to using vesamenu for sub-menu config files. Remove unused Prompt 0 from config. Re-enable Ubuntu gfxboot. 04/14/16 Version 2.0.2.2: Update to support Linux Kid X, Linux Lite, Subgraph OS, and Calculate Linux Desktop. Re-enable entry for Offline NT Password and Registry Editor. 04/06/16 Version 2.0.2.1: Update to support WattOS, update SLAX option, update links, disable feature to close all open explorer windows when format option is selected. Update Fat32Format. 12/28/15 Version 2.0.2.0: Add GRUB (partition 4) option. Update to support Xioapan, Windows 10, Bitdefender Rescue CD options. Update DBan option. 10/28/15 Version 2.0.1.9: Remove distributions that are no longer being developed. Fix broken links. 03/18/15 Version 2.0.1.6: Add support for Tahrpup 6.0, Debian Live 7.8.0, and OpenSuSe 3.2. 01/20/15 Version 2.0.1.5: Fix broken 64bit option for Parted Magic entry. 01/15/15 Version 2.0.1.4: Update to support 2015_01_13 Parted Magic. 01/13/15 Version 2.0.1.3: Remove Acronis True Image entry (Use Try Unlisted ISO GRUB for Acronis). Updated links. 10/30/14 Version 2.0.1.2: Enable checkbox option to forcefully Show All ISO Files. 10/29/14 Version 2.0.1.1: Update to support Linpus Lite, minyMac, and ESET SysRescue Live. Fix AntiX boot issue. 09/19/14 Version 2.0.1.0: Switch to use Syslinux 6.0.3 to address ERR: Couldn't read the first sector issues. 09/11/14 Version 2.0.0.9: Add Dr.Web LiveDisk. Fix broken System Rescue CD, and HDT option. Update Ubuntu download options. 08/14/14 Version 2.0.0.8: Fix Windows Vista/7/8 and Hiren's options. 07/31/14 Version 2.0.0.7: Switch to use Syslinux version 6.02. 07/29/14 Version 2.0.0.6: Update to support Peach OSI. 05/29/14 Version 2.0.0.5: Update Ubuntu, CentOS, and Debian Download Links. Remove Backtrack – superseded by Kali. 04/29/14 Version 2.0.0.4: Update to support CAINE and Puppy Arcade. 04/17/14 Version 2.0.0.3: Update to support Tails 0.23 and Rescatux 0.30.2 (must manually extract and use Rescatux.iso from the ISO). Correct OpenSuse links. 03/18/14 Version 2.0.0.2: Update to support newer version of Offline Windows Password & Registry Editor, LuninuX OS, Pear Linux, and Konboot 2.3 Pro. 02/20/14 Version 2.0.0.1: Fixed Linux Mint 16 Live Installer Crash! 01/30/14 Version 2.0.0.0: Added support for JustBrowsing, Mythbuntu, Bugtraq II, and older pmagic_2013_05_01.iso. 01/10/14 Version 1.9.9.9B: Added support for Fedora 20, LXLE Desktop. Fixed source compilation bug. 12/11/13 Version 1.9.9.9: Delete redundant Ophcrack folders. Re-enabled Dr.Web, Trinity, and RIP Linux. Support Elementary 32 bit. 12/06/13 Version 1.9.9.8: Add option for Paid version of Kon-Boot. Added Manjaro Linux. 12/04/13 Version 1.9.9.7B: Correct ISO Name for Desinfect. Correct OpenSUSE ISO copy failed when using Windows XP. Add support for Rescatux ISO (can't use sg2d version). 11/24/13 Version 1.9.9.7: Modify chain.c32 to address Insane Primary (MBR) partition error. Correct Kaspersky Rescue Disk (Antivirus Scanner) syslinux directory copying issue on Win XP. 11/22/13 Version 1.9.9.6B: Added OpenSUSE. Corrected Desinfec't misspelling. 11/20/13 Version 1.9.9.6: Add Desinfec't 2013 (German Antivirus). Fix broken older Parted Magic menu entries. 11/13/13 Version 1.9.9.5B: Add WifiSlax. Thanks to Geminis Demon for helping finish the entry! 11/12/13 Version 1.9.9.5: Added provision to ensure menu.32 exists. Fixed Falcon4 and Hiren menu creation. 11/11/13 Version 1.9.9.4: Added Persistent Option for Ubuntu and some Derivatives. Fix Kon-Boot free entry. Switch to AutoDetect Size of ISO. 11/07/13 Version 1.9.9.2: Add support for TAILS, and Ultimate Boot CD. 11/05/13 Version 1.9.9.1: Quick fix to support older versions of Knoppix. 11/04/13 Version 1.9.9.0: Beta release of YUMI version 2. The following instructions were performed from an Ubuntu 16.04 host environment. NOTE: YUMI persistence option is currently broken when using YUMI-2.0.6.4.exe within WINE. Don't choose persistence and set the slider or the process will freeze while trying to build the persistent file and you will be forced to close YUMI. How YUMI Works: YUMI (Your Universal Multiboot Installer) enables each user to create their own custom Multiboot UFD containing only the distributions they want, in the order by which they are installed. A new distribution can be added to the UFD each time the tool is run. Not all Unlisted ISO's can be booted (thus adding Unlisted ISOs is an UNSUPPORTED option). Make sure your USB drive is using a Fat32 or NTFS partition with an MBR (Master Boot Record). An exFAT formatted Partition will not work. GPT (GUID Partition Table) Fat32 or NTFS Partitions are also not supported. The Windows to Go option creates a VHD file that is 20GB in size. As such, it requires the drive to be formatted NTFS. Fat32 cannot support a file more than 4GB in size. Many flash drives you might find at local department stores won't be fast enough. You'll need a Very Fast Flash Drive. When Windows boots from the USB for the first time, it'll go through the setup process and then reboot. You'll need to boot using your Windows to Go menu option a second time to finalize the setup process and finally boot into your full Portable Windows. The Single Windows Installer/PE options are most likely to work for both stock and modified ISO files. When using it, you are limited to storing one Windows Installer per USB drive (I.E. one Win XP and one Win Vista 7 or 10). The Multiple Windows Installer/PE options allow for storing more than one stock Windows Installer per drive. Generally, only unmodified Windows ISO files will work with this option. Try Unlisted ISO (Grub Partition 4) – This boot option attempts to boot the ISO file using Grub. Additionally it adds a 4th partition table to the USB device and uses this as a placeholder for the ISO. This option has been shown to successfully boot almost all Linux based distributions. Try Unlisted ISO (Grub) – Same as boot option 1, but attempts to boot the ISO without using a 4th partition as a placeholder for the ISO. Try Unlisted ISO (Grub From RAM) – Same as boot option 2, but attempts to store the ISO in system memory and boot it from there. Useful for cases where the ISO is small, and you'd like to boot the OS and then move the USB to different machines and subsequently boot the OS from them as well. Try Unlisted ISO (via Syslinux) – The original default YUMI supported boot option. Syslinux works to boot many distributions, but not all. Multiboot folder and volume name. YUMI tries to store most added distributions within the multiboot folder. This is also the root directory set for syslinux. 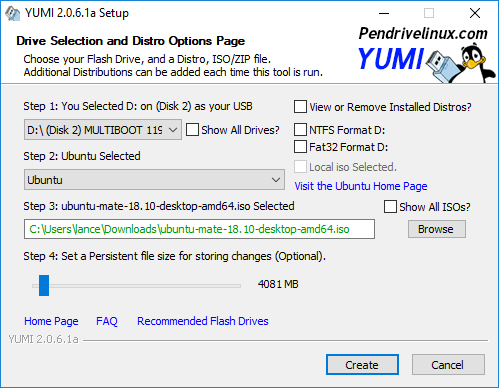 In some cases, YUMI also expects the Volume Label of your USB drive to be MULTIBOOT in order for OpenSUSE, CentOS and several other distributions to boot. YUMI attempts to automatically create this Volume Label, however it can sometimes fail. Please ensure that the Volume Label of your USB remains MULTIBOOT if you expect your distributions to boot. When booting linux distributions such as Ubuntu from some laptops such as the Lenovo Yoga with a touchscreen, the acpi=off boot parameter might be necessary in order to successfully boot. My PC wont Boot from my Flash Drive, but BIOS supports USB boot! Some Flash Drives ship formatted (without a partition), and YUMI requires the drive to contain a partition with a MBR (Master Boot Record). To ensure compatibility, you can use YUMI to format your device as NTFS or Fat32. This is useful if your YUMI prepared USB drive is somehow no longer bootable. From the multiboot folder on your flash drive, delete the hidden file ldlinux.sys and then rename the libcom32.c32 file to _libcom32.c32. Then use YUMI to install any menu item. YUMI will notice that the file is missing and will attempt to reinstall syslinux and repair the master boot record. Once finished, rename _libcom32.c32 back to libcom32.c32. Delete the hidden ldlinux.sys file from the multiboot folder, and use YUMI to install any menu item. YUMI will notice that this file is missing and will attempt to repair it. TAILS – If your USB is detected as a "fixed" hard drive and not a "removable" disk, (a few Sandisk drives have the removable bit flipped this way), you'll need to remove occurrences of the boot parameter "live-media=removable" from the Live64.cfg file found at "\multiboot\tails-amd64-3.3\EFI\BOOT\" or TAILS will fail to find the live filesystem. Flacon 4, Hiren's Boot CD, Trinity Rescue Kit, Backtrack, Avira Antivir, and Dr.Web Live CD files are stored outside of the multiboot folder. Most other distribution files remain contained within the multiboot folder. I am open to a simple working solution! 3.) Finally, after (Stage 2) is complete – upon the second reboot, select (Stage 3) to boot the drive where you installed Windows XP. If this option fails, simply remove the USB and reboot! * YUMI does support NTFS, however not all distributions will boot from an NTFS formatted device. NTFS is required for Windows to Go and distributions containing files over 4GB. wincontig – GUI tool to defragment ISO files. If you don't have a floppy drive and get fd0 errors while booting, simply add floppy.allowed_drive_mask=0 to the append line for the troubled entry. Although the best fix is to simply disable floppy in BIOS. Persistently Saving Changes: YUMI currently enables the casper-rw persistence feature for some (but not all) Ubuntu based distributions. Yes, you can have multiple persistent Ubuntu based distributions, as each distro utilizes its own casper-rw file. * Persistence will NOT work on NTFS formatted USB drives. Some Distributions also will not even boot via NTFS! Ophcrack Tables: To load Ophcrack tables when booted in this fashion, the tables folder needs to exist at the root directory of the USB device; (example F:\tables\vista_free). Get Ophcrack Tables from the Official Ophcrack site and unzip to your USB. You can have both XP and Vista/7 tables working together. YUMI on Linux: You can run YUMI on a Linux Host via WINE. <– currently untested, and possibly broken.